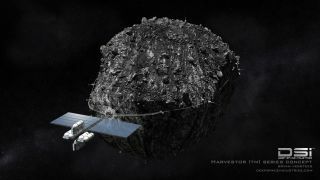 Artist's illustration showing Deep Space Industries' Harvestor-class spacecraft for asteroid mining. PARIS — The Luxembourg government on Feb. 3 announced it would seek to jump-start an industrial sector to mine asteroid resources in space by creating regulatory and financial incentives. Luxembourg is home to satellite fleet operator SES, whose ascension from outsider-startup status in the 1980s to today's place as one of the two largest commercial fleet operators by revenue Schneider cited an example of what is possible when Luxembourg sets its mind to something. SES in the past three years has been the biggest commercial backer of SpaceX, whose stated corporate mission is the establishment of a human colony on Mars. Schneider said extracting water from asteroids to create fuel for deep-space missions is one application of space mining. Luxembourg Vice Prime Minister Etienne Schneider says Luxembourg will offer regulatory and financial incentives to space resource-mining companies. In an interview, Schneider said the Luxembourg government has already selected a European, an American and a Chinese national to be members of the advisory board. The Chinese and U.S. members will be arriving in the next couple of months, he said. The European is Jean-Jacques Dordain, former director-general of the 22-nation European Space Agency. In a press briefing with Schneider, Dordain said the tools that the Luxembourg government is placing at the disposal of space-mining companies means space-mining entrepreneurs "have no more excuses to go to California." Schneider cautioned that Luxembourg is not offering tax haven-type advantages. R&D tax credits are available in the United States as well, and Schneider conceded that the intellectual and financial effervescence of Silicon Valley exerts a powerful pull on European engineering talent. But he said Luxembourg offers advantages that are difficult for the U.S. federal or state governments. "Our R&D system gives me the opportunity to reimburse 45 percent of the company's R&D investment," Schneider said. "It's quite attractive for international companies to do their R&D in Luxembourg. "What's more, the Luxembourg government has committed to invest in the capital of these companies as well. If we think they have an interesting project, we are committed to invest directly into their capital. "We can do this by different means: We can invest by different government investment funds we own, and also the government's investment bank. We have all these means of supporting companies and of course the Luxembourg financial industry is interested in supporting them." Schneider said the Luxembourg government in the coming months would be assembling a mid-term space budget to be presented to the ESA ministerial council, scheduled for December. As a part of that process, he said, the government will determine how much financing to set aside for the space-mining initiative. He said selecting an American, a European and a Chinese national as initial board members was no accident. Since the U.S. Commercial Space Launch Competitiveness Act was enacted in November, Schneider's office has sought the opinion of Chinese experts on the legalicy and commercial future of space-resource commercial exploitation. Schneider said he has been interested in asteroid resource mining since 2013 — well before the U.S. Commercial Space Launch Competitiveness Act. The U.S. bill appeared headed for international legal protest because it endorses commercial extraction by U.S. citizens of resources from asteroids, the moon or other celestial bodies. But the International Institute of Space Law has issued a mainly favorable assessment of the legal validity of the Space Act, and senior European Union officials have as well. Schneider likened the Space Act to fishing rights in international waters – the fisherman can harvest the resources without laying claim to ownership of the oceans. He stressed that it is more than just legality. Luxembourg, he said, has a non-threatening, neutral-party reputation that might serve to blunt legal protests against space mining and elicit more international participation in a collective effort. Dordain said he was approached by Schneider in July and spent the summer researching the issue to determine its feasibility. He said he concluded that all the major elements of a space-mining mission have been demonstrated by one or another of the world's space agencies, and that commercial ventures could stand on these agencies' shoulders to make a business. "Going to an asteroid — done," Dordain said. "Landing on an asteroid — done. Collecting samples — done. Returning samples to Earth — done."